Notorious meddler Robert Amsterdam back in Thailand. 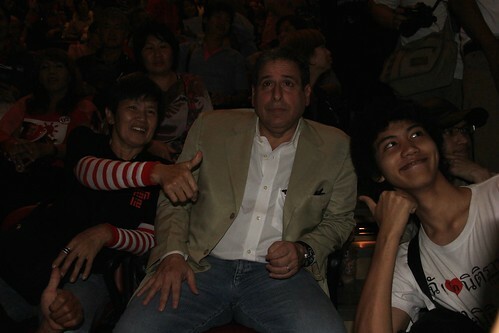 January 29, 2012 - Globalist lawyer Robert Amsterdam of Amsterdam & Peroff, a Chatham House corporate member, was spotted at Thailand's "Nitirat" "campaign committee for the amendment of article 112." The group of Nitirat academics claim to be independent, seeking to "reform" Article 112 designed to protect Thailand's sovereign institutions, and roll back legal changes instituted after the 2006 military coup that ousted Prime Minster Thaksin Shinawatra. Image: Robert Amsterdam, corporate lobbyists, globalist, and "celebrity lawyer" concurrently represents both deposed autocrat Thaksin Shinawatra and his street mob “red shirts” also known as the United Front for Democracy Against Dictatorship (UDD). 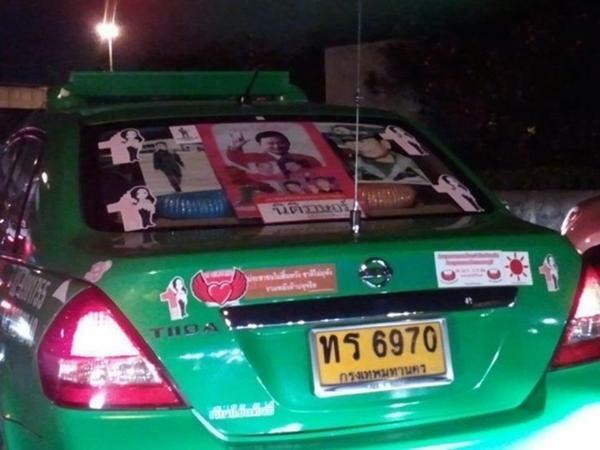 Despite claims that Nitirat is an academic movement, it is clearly an attempt to re-brand the street hooligan image of Thaksin's political devotees. Already, at face value, Nitirat's narrative is tenuous at best. While it is noble indeed to keep in check military powers after a coup deposes a nation's government, Nitirat makes no mentions of the numerous and grave transgression committed by Thaksin which necessitated the coup in the first place, nor the continued danger Thaksin's attempt to restore himself to power poses. Thaksin had been overtly working for foreign corporate-financier interests, most notably the notorious Carlyle Group, long before even taking office in 2001. In 2003 Thaksin's government waged a 3 month "War on Drugs" that saw over 2,500 people murdered in the streets extra-judicially, many of whom were determined later to have had nothing to do with the drug trade. In 2004, Thaksin attempted to ram through a US-FTA without parliamentary approval while systematically eliminating check and balances as he consolidated power. And while Nitirat claims Article 112 infringes "freedom of speech," Thaksin himself pursued a draconian campaign to muzzle critics amongst local media, legally if possible, extra-legally when necessary. In all, Thaksin was an autocratic, mass-murdering tyrant who effectively eliminated judicial measures designed to reel in such abuses of power. On September 18, 2006, on the eve of the military coup that unseated him from power, Thaksin was before the corporate-financier Council on Foreign Relations in New York City, providing the council with a progress report and reaffirming his ties to Wall Street and London. 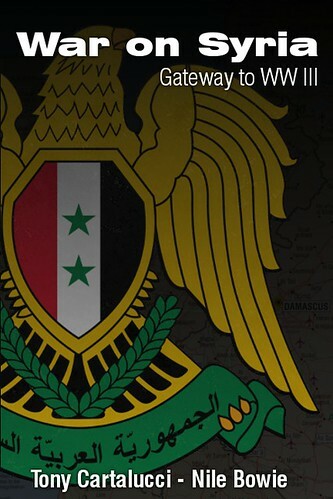 If ever there was a time for a nation's military to honor its oath to defend against all enemies, foreign and in this case domestic, it was Septermber 19, 2006. Following such a drastic measure, responsible citizens have the duty to hold the military accountable and ensure a transition back to a representative form of government. This also includes dismantling the removed regime's political machine to ensure such a transition doesn't invite ousted autocrats right back into power. This is suspiciously absent from Nitirat's agenda, and this alone compromises Nitirat's academic legitimacy entirely. 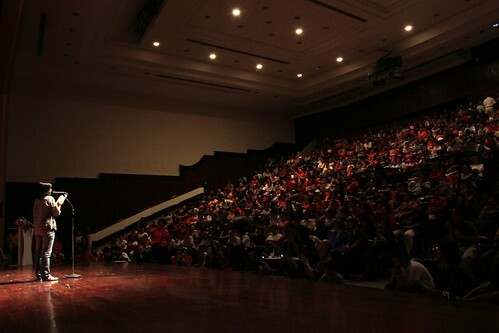 Image: While it certainly looks like an indoor red shirt rally attended by globalist-proxy Thaksin Shinawatra's supporters, Nitirat insists it is independent, objective, rational, and not politically entwined with Thaksin and his foreign sponsors. 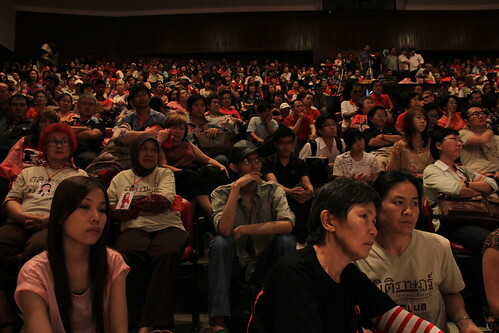 However, Nitirat's legitimacy is complicated further when considering its followers are mostly drawn from Thaksin's "red shirt" street movement and even during Nitirat conferences, audience members are dressed in red with pictures of Thaksin Shinawatra and his sister who is serving as prime minister in his place, adorning their bodies in a surreal display of cult-like veneration rivaling anything to be found in Pyongyang , North Korea. 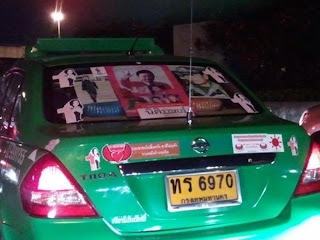 Should Nitirat demand that Thaksin's perverse, exploitative cult of personality and political machine be dismantled along side military enacted measures following the 2006 coup, Nitirat's following would be nullified. Image: A closer look at Nitirat's audience reveals many attendees wearing images of Thaksin, his sister now serving as PM in his place, and "Truth Today" shirts featuring the images of Thaksin's street mob leaders - who also serve in Thaksin's political party as advisers, and MP's. It should be noted, that Nitirat's second point of contention, Article 112, has been exclusively used to target members of Thaksin's seditious, foreign-funded movement. 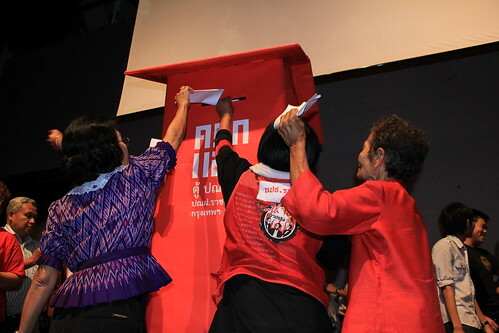 While foreign media portrays those targeted with 112, like Abhinya Sawatvarakorn aka "Joss Stick," as innocent victims simply speaking their mind, in each case, it turns out these "victims" are active members of the Thaksin's red shirt movement, and in "Joss Stick's" case, even took to the stage during rallies organized by Thaksin and his foreign sponsors, at the invitation of Thaksin's own political lieutenant, Jakrapob Penkair. It should be noted that "Joss Stick" is also a Nitirat supporter. Nitirat is clearly an attempt to re-brand and clean up the image of Thaksin's "red shirt" street mobs, notorious for acts of violence and for displaying an overt ignorance clearly being exploited instead of remedied with improved education. And while academics disingenuously feign concern over democratic values on stage indoors, rather than blocking city streets with vulgar bull-horning demagogues outdoors as usual, Nitirat is still nothing more than a red shirt rally. 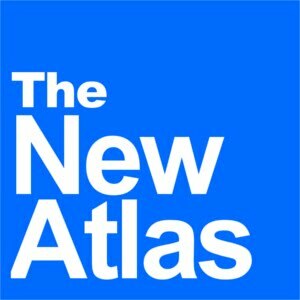 Since the 2006 military coup that ousted Thaksin Shinawatra, he has been represented by US corporate-financier elites via their lobbying firms including, Kenneth Adelman of the Edelman PR firm (Freedom House, International Crisis Group, PNAC), James Baker of Baker Botts (CFR), Robert Blackwill of Barbour Griffith & Rogers (CFR), Kobre & Kim, and currently Robert Amsterdam of Amsterdam & Peroff (Chatham House). Amsterdam's client Thaksin Shinawata isn't the first billionaire proxy he has attempted to groom and assist back into power. He has also provided extensive legal and political support for jailed Russian oligarch, Mikhail Khodorkovsky, on behalf of Wall Street and London. The background of Khodorkovsky and his "Open Russian Foundation" fashioned after Wall Street bankster George Soros' Open Society Institute and chaired by both Jacob Rothschild and Henry Kissinger, can be found in William Engdahl's, "The Real Crime of M. Khodorkovsky," as well as in the London Telegraph's humorously titled, "This man is now the people's billionaire," reflecting the paid-for rhetoric typical of Wall Street-London-appointed lawyer Robert Amsterdam. In the latest round of attempted destabilization in Russia, it may be instructive to look at the "Khodorkovsky & Lebedev Communications Center," a website developed in part by Robert Amsterdam and what is called an "international legal team." Coincidentally, it fully embraces the narrative peddled by the West and its corporate media that the Russian elections were "rigged." However, this accusation tenuously hinges on the work of US-funded NGOs including Golos - fully funded by the National Endowment for Democracy (NED). Similarlly in Thailand, NED-funded Prachatai forms a symbiotic relationship with Thaksin's red shirts and now Nitirat to lend each other otherwise nonexistent legitimacy, legitimacy that is essential in order for Amsterdam to sell his agenda to a wider audience. Just as Robert Amsterdam is doing in Russia, where he is using his "defense" of Khodorkovsky as a point of leverage to support US-backed mobs in Moscow's streets, his defense of Thaksin and his red shirts also aims not at defending his clients legally, but at using their case to undermine and ultimately overturn the sovereign institutions of Thailand. It is done in a concerted effort with the US State Department, the corporate media, and a vast network of US and European subsidized NGOs sowing sedition throughout Thailand itself. Amsterdam's presence, amongst a sea of red-shirted Thaksin supporters at the Nitirat conference confirms there is nothing revolutionary at all about Nitirat, beyond perhaps the imagination of those devising Thaksin's political strategy. While the name has been modified, and the label redesigned, at the core we still find Thaksin, his red shirts, and the foreign agenda that drives them both. To understand why global corporate-financiers are interested in Thailand, please see, "Hillary Clinton and the New American (Pacific) Century: Secret no more, US moves openly to block the rise of China." Photos courtesy of "Red Shirts for Democracy" illinoisredshirts.blogspot.com.